The war on terror has made the world less safe and is not addressing the underlying causes of conflict, Pakistan's president has told the BBC. In an interview for the Newsnight programme, it was suggested to Gen Pervez Musharraf the world was less safe - in part because of the campaign. "Absolutely," he said, adding that the social grievances that helped recruit terrorists were not being addressed. 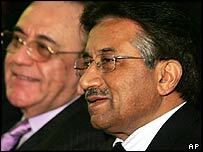 Gen Musharraf is in the UK and has held talks with Tony Blair. He was expected to tell the prime minister during their meeting at Downing Street that more effort needed to go into fighting illiteracy and poverty as well as resolving the Israeli-Palestinian conflict. "We are not addressing the core problems," he told Newsnight. "Therefore we can never address it in its totality. We are fighting it in its immediate context, but we are not fighting it in its strategic, long-term context." He said a war on terror needed to combat the political disputes and social inequalities that gave rise to extremism. "What gives rise to a young man or woman to give up her or his life? It is the political disputes and we need to resolve them and also illiteracy and poverty. "These combined are breeding grounds of extremism and terrorism." BBC diplomatic correspondent James Robbins said Mr Blair would certainly agree that real progress towards Middle East peace between Israelis and Palestinians was vital. But he would not concede the world was less safe because of the war on terror, he said. Gen Musharraf and Mr Blair also discussed trade and the situation in Pakistan's neighbour, Afghanistan, and Kashmir. The president, who is on his first official visit to London, will visit the Pakistani community in Manchester after the talks. Gen Musharraf arrived in Britain on Sunday night after flying from the United States, where he met President George W Bush. The interview with Gen Musharraf will be screened on Monday, 6 December, 2004. Newsnight is broadcast on BBC Two at 2230 BST every weeknight in the UK.